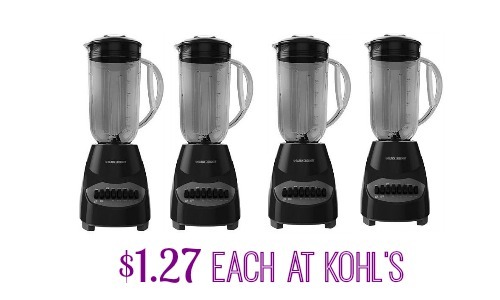 Home > Household Deals > Kohl’s Coupon Codes: Black & Decker Blender for $1.27! Kohl’s Coupon Codes: Black & Decker Blender for $1.27! Need a new blender Kohl’s is your store! You can currently get a really great deal on Black & Decker Blenders! You will also earn $10 Kohl’s Cash for every $50 you spend through 2/4. You’ll be able to redeem it 2/5-2/14. Makes it $5.08 for all (4) blenders or $1.27 each! You’ll be stocked on wedding gifts for the next year. The rebate ends 1/31. This will sell out though, so grab it now!